Between 1 January and 26 February 2017, Italy registered the arrival of 13,457 refugees and migrants. According to the Italian Interior Ministry, this is an increase of a third compared with the same period last year. Between 20-23 February alone, a total of 2,460 individuals were rescued from distress at sea. On 23 February, to take a single day, the Italian Coast Guard reports that 1,100 people were saved in 9 separate rescue operations involving numerous different actors, including the British Navy Ship ECHO. As a result, the world’s oceans have been divided into thirteen search-and-rescue areas (SAR), with different coastal States being assigned responsibility along geographic lines. Read together with the 1979 Convention on Maritime Search and Rescue and the 1974 International Convention for the Safety of Life at Sea (SOLAS), States have generally accepted that the responsibility of disembarking those rescued falls to those States in charge of the SAR areas. It is within this international framework that SOS MEDITERRANEE operates its rescue vessel Aquarius in the Central Mediterranean between Libya and Italy, under the coordination of the MRCC in Rome. 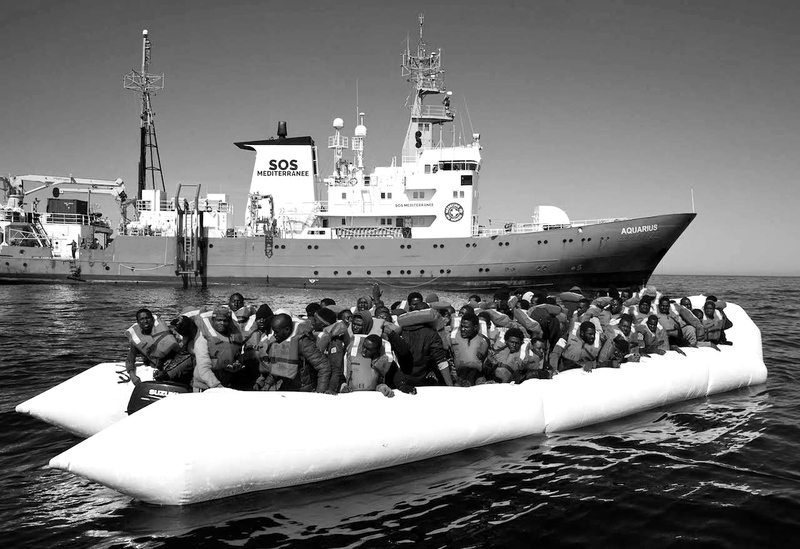 SOS MEDITERRANEE is a European non-profit organisation, founded in 2015 as a direct response to the cessation of ‘Mare Nostrum’. This was a search-and-rescue operation implemented by the Italian government in response to a shipwreck resulting in mass casualties off the Italian island of Lampedusa in October 2013. The Mare Nostrum operation was wound down in October 2014 after it became clear that Italy would receive very little support from other European countries and could not bear the financial costs on its own, while also facing a political backlash. Britain’s Foreign Office Minister Baroness Anely said in October 2014 that: “We do not support planned search-and-rescue operations in the Mediterranean. We believe that they create an unintended ‘pull factor,’ encouraging more migrants to attempt the dangerous sea crossing and thereby leading to more tragic and unnecessary deaths.” Although it was estimated that Mare Nostrum saved up to 150,000 lives, it was replaced by Frontex’s Operation Triton, whose primary focus was on border protection, no longer on saving lives. Depicting search-and-rescue efforts as a “pull factor”, motivating migration across the Mediterranean, unfortunately ignores the reality that one of the main reasons people take on the dangerous journey across the Mediterranean is the absence of regular or legal access to Europe. It also ignores the geopolitical realities of our interconnected world, and European activities in the regions that now produce large numbers of refugees and forced migrants. As pointed out by Ralph Wilde, take for example the US and UK involvement and defence trade with Saudi Arabia, and then in turn Saudi Arabia’s involvement in Syria. In a similar vein, Germany’s arms trade to non-EU or NATO countries tripled between 2014 and 2015, meaning that weapons were sold to countries likely involved in conflicts or with troubling human rights records. More recently, on 3 February 2016 the European Council adopted the “Malta Declaration on the external aspects of migration: addressing the Central Mediterranean route”. As its main goal, the Malta Declaration names effective border control, to be achieved by reducing migratory flows along the Central Mediterranean Route and targeting smugglers. To achieve these goals, the EU will cooperate with the government of Libya – a failing State known for its severe human rights violations. Numerous NGOs have criticised the Declaration, as it demonstrates the human costs the EU is willing to sacrifice in order to further secure its borders. Such accounts of abuse are common, along with accounts of arbitrary detention, violence in the streets and stories of sexual violence. They all paint the same picture of Libya – a country that is not safe and not stable, as different groups grapple for power. The Malta Declaration also seeks to provide the Libyan Coast Guard with equipment and technical assistance needed to break the human smuggling cycle, i.e. to stop boats from leaving. If anything, the increase in numbers should serve as indication that very little can stop those fleeing persecution and violence, not just in their home countries but also in Libya. By actively supporting the Libyan Coast Guard, the EU therefore risks condemning protection seekers to a place of violence, and it is to be seen how the principle of non-refoulement will be observed. The EU’s approach may also potentially force people to seek out even more dangerous routes, all in an effort to escape Libya. It is important to note that Libya is not a party to the 1951 Geneva Refugee Convention, which begs the question how migrants and asylum seekers’ rights will be protected on the ground. Before extending its rescue efforts over these winter months, SOS MEDITERRANEE was told that numbers would decrease, due to harsher weather conditions. However, quite the opposite is true, and as numbers have increased, the EU thinly veils its concerns over immigration as concern for human smuggling. It remains to be seen what effect the Declaration will have on the humanitarian work of the civil society actors operating in the Mediterranean. Lea graduated from University College London in September 2016, with an LLM in Human Rights Law. She now works as a legal researcher in London while also supporting the communications, press and advocacy work of SOS MEDITERRANEE.